First came holy Minecraft and shortly after, Terraria. This year, say hi to Towns – the town building game with a twist of creativity involved. If Terraria is for the platform fans, then it is quite safe to assume that Towns will appeal to the folks who like city building game with a touch of resource management, defense building and a little adventuring. It plays like an RTS – almost. The foundation of the game is largely similar to most conventional RTS. There are civilians who are the workhorse of your economy as they go round gathering resources and construct your structures block by block. Then there are guards which have to convert from the pool of civilians. Guards protect your population, patrol the town or become supervisors, which basically force the poor peasants work harder. And there heroes that are attracted to the settlement. Heroes comes in different classes and can gain skills based on their level and class. Heroes will actively seek out hostile mobs to do battle with. 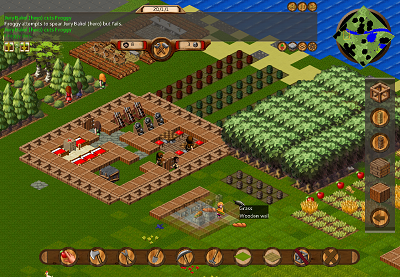 The main objective of the game is survival and the player is forced to make decisions based on the terrain and resource distribution on the map. While it is understood that resources is the key to winning the game, the player is also confronted with the problem of over extension. There will only be that many civilians attracted to the town based on the amount of accommodation that have been constructed. And guards are drawn from the pool of civilians in the town. It can be a daunting task for a handful of guards to guard a large amount of territory even when they are properly armed. To reduce the workload of the player, the developers created a set of parameters which the players can toggle with. From priority settings to stockpile refills. This works really well for the manufacturing component of the game. However, the overall AI still needs improvement. Especially when it comes down to civilians working on construction projects, mining and resource gathering or dealing with hostile mobs. This often leads to high “accidental” deaths rates of the population which is tedious to replace. The heroes on the other hand, have better survival mechanisms as compared to the town folks. They flee from battle once their health goes down to critical levels. But then again,heroes are heroes for a reason, no? The game in general is a really good time black hole. It is definitely here to stay and really hard for anyone to get bored with when it is designed for fans of city building games with a touch of tower defense without fancy bells and whistles. While survival is the main stay of the game, players will also get to enjoy expressing their creativity as they built their town against the increasing difficulty of the game. Another plus to the title is every game starts with a randomly generated map. In other words, no two game of Towns can be played the same way. If you are already keen on getting this game, it can be purchased from their website for US$20. The game is has been given the Greenlight approval to be sold on Steam.